What is wound bed preparation? Keywords: wound bed preparation; bacterial balance; debridement; exudate management; chronic wounds; senescence. The aim of wound bed preparation is to create an optimal wound-healing environment by producing a well vascularised, stable wound bed with minimal exudate. Bacterial load has a direct impact on wound healing. The management of the bacterial load by either local or systemic therapy is important in wound management. 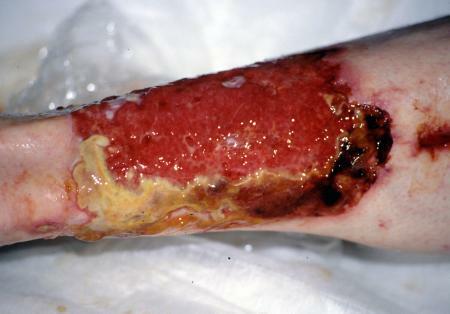 Necrosis is related to bacterial load and can be managed by debridement. A number of alternative methods of debridement are available. Debridement is often a gradual process; the choice of methods will depend on the wound status, the time frame for debridement and the available skills and resources. Chronic wound exudate can slow or prevent wound healing and can reflect changes in bacterial load. The management of exudate ranges from absorptive products through negative pressure devices to compression. 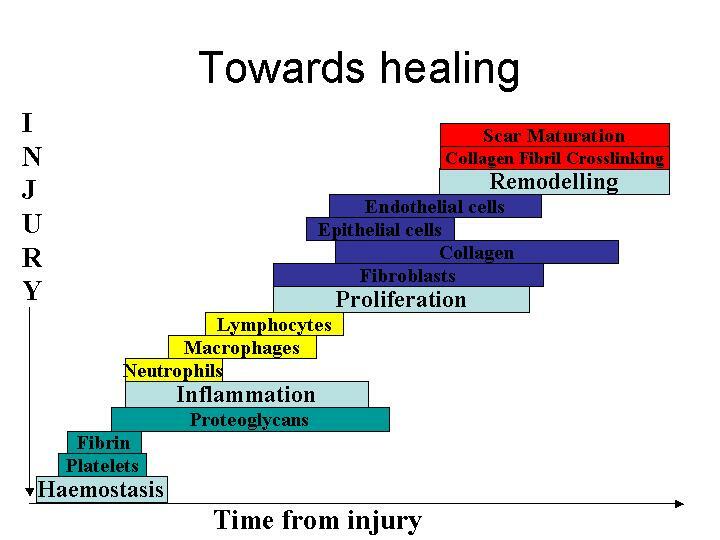 In chronic wounds cellular dysfunction and senescence delay healing. These dysfunctions often extend beyond the wound bed and may reflect the underlying disease process. The complex nature of these biochemical abnormalities indicates the need for greater understanding of the mechanism underlying non-healing in chronic wounds. This paper explores the concept of wound bed preparation and relates this to five key areas of care: bacterial balance, necrosis, exudate, cellular dysfunction and biochemical balance. Wound bed preparation is the inter-relationship of these elements to a global framework of care. In this article, the practical aspects of using this framework are discussed. The formation of a healthy wound bed is a prerequisite to the use of many of today's advanced wound care products. Unless this is achieved, even the most sophisticated and expensive materials are unlikely to function correctly . The concept of wound bed preparation (WBP) as a treatment aim, represents a new direction in wound care thinking. The processes involved are, however, not new and have been part of good wound care practice for some time. What has changed is our realisation that wound management must focus on both the wound and the patient as a whole, and have a defined aim. This will frequently require a multidisciplinary and structured approach to care. These changes are underpinned by our ever-increasing knowledge of the biological microenvironment within a chronic wound and centre on the inter-relationship of functionally abnormal cells, bacterial balance, inappropriate biochemical messengers and dysfunctional wound matrix components. The patient's physical and psychological status, as well as the wound itself, influence all these elements and will vary with time. The aim of WBP is to create an optimal wound-healing environment by producing a well vascularised, stable wound bed with little or no exudate . 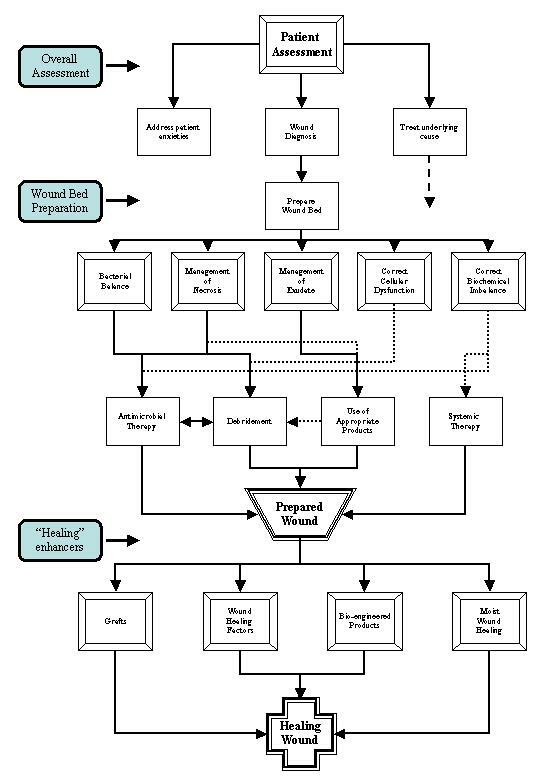 A framework for WBP has been presented by Falanga ,Figure 1. These components are inter-related although the relative importance of each in a particular wound will vary. Many therapeutic actions address several of these components, albeit with variable degrees of effectiveness; for example, cadexomer iodine dressings may work towards restoring bacterial balance, aid wound debridement and absorb mild to moderate exudate. Wounds are dynamic and although a wound may gradually approach a healed state, it may also regress, for example, as a result of an infection or a change in the status of the patient's underlying medical condition. The process of WBP therefore needs to be flexible and should always reflect the wound state at a particular point in time. Experimental evidence suggests that a bacterial load of between 105 and 106 organisms per gram in a wound bed, irrespective of the organism, will adversely affect wound healing . For some more virulent organisms, however, a lower level may cause infection. Bacterial colonisation is three dimensional and infection can, and often does, extend into the deep compartment of the wound; surface swabs may not therefore give a true reflection of the bacterial burden and may need to be augmented by tissue culture . Therapy should reflect the clinical status of the wound and not be based on culture results alone. Over time, the bacterial status of the wound will vary and it is important to recognise the changes that indicate wound deterioration and respond to them quickly. These may include increasing exudate, pain, odour, bleeding or tissue fragility (Box 1). Correction of the bacterial balance may be inhibited by the presence of a biofilm that consists of attached microorganisms within a secreted glycocalyx. The presence of biofilm represents a focus for infection, which is protected from the effects of antimicrobials, including antibiotics . Not all organisms within a biofilm will be the same, which compounds the problems associated with treatment or eradication . to proceed with conventional moist dressings. A balance has to be made between the risk to surrounding viable tissues from rapid debridement techniques, such as surgical or sharp debridement, and the danger of prolonged exposure to necrotic tissue and its associated bacterial load. The choice for the initial debridement technique is usually determined by the speed of debridement considered appropriate for a particular wound. Secondary or maintenance debridement methods will vary according to the effectiveness of the initial debridement. Not all wounds will benefit from debridement and in some cases an undisturbed dry eschar (as seen in this mummified toe Figure 4) is a better option for the patient. In this case, any attempt at debridement, unless combined with treatment of the underlying condition by limb revascularisation, may simply convert inert dry gangrene to potentially limb or life threatening moist gangrene. Goals of treatment must therefore be based on a realistic assessment on the 'healability' of the wound . A number of inter-related options for wound debridement exist (Box 2). Sharp and surgical debridement rapidly remove necrotic tissue and reduce the bacterial burden, but also carry the greatest risk of damage to viable tissue and require high levels of technical skill . Enzymatic, chemical, mechanical and autolytic debridement are frequently regarded as safer options, although the risk to the patient of ongoing wound complications is greater. For most chronic wounds, debridement will be conducted over a number of weeks and require more than one method (Figure 5a, Figure 5b, Figure 5c, Figure 5d, Figure 5e). Sharp debridement is a conservative method which frequently leaves a thin margin of necrotic tissue within a wound; surgical debridement is more extensive and usually requires anaesthesia. The later aims to convert a chronic wound to an acute wound by complete excision. This, however, does not correct the pathogenic abnormalities that may extend well beyond the wound's margins. Although removing part of the bacterial burden and eschar, surgical excision may, in some cases, simply enlarge a chronic wound. For the majority of wounds sharp, rather than surgical debridement, will be sufficient. The recommendations for effective sharp debridement are given in Box 3. Following sharp debridement a secondary debridement technique is usually necessary, such as larval therapy or autolytic debridement. This process relies on the addition of proteolytic and other exogenous enzymes to the wound surface. These enzymes break down necrotic tissue and can be effectively combined with moist wound healing. To allow maximum enzymatic function, it requires a good delivery system, a prolonged period of enzyme activity, and the correct wound environment, which includes moisture, appropriate wound pH and temperature. Enzymes are inactivated by heavy metals (silver, zinc), which may be introduced from some wound care products, such as antimicrobial dressings (e.g. Actisorb Silver, Flamazine) and detergents present in skin cleansing agents inactivate enzymes. Care must be taken, therefore, to use enzymatic debridement agents such as collagenases in the correct care sequence if they are to be maximally effective. Alternative newer, multi-enzyme products, such as those developed from crab and krill , are now available as commercial products or are currently under clinical trial. In addition to their debriding action, agents containing bacterial collagenase have been shown to enhance macrophage chemotaxis and activation , . This process relies on enhancing the natural process of selective liquefaction, separation and digestion of necrotic tissue and eschar from healthy tissue that occurs in wounds because of macrophage and endogenous proteolytic activity . This is achieved by providing a moist wound environment and, as such, is likely to be integral to wound care management. The use of occlusive, semi-occlusive or moist interactive dressings can both promote phagocytic activity and the formation of granulation tissue. Autolytic debridement is recognised to be effective in the maintenance phase of debridement. 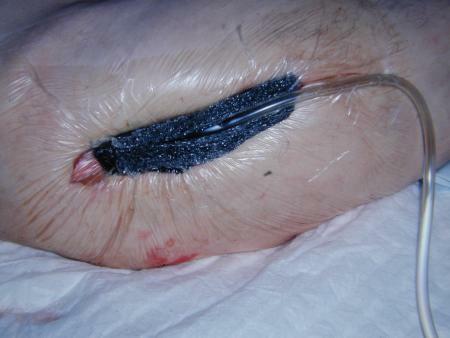 This is the use of non-discriminatory physical force to remove necrotic tissue and debris from the wound surface. 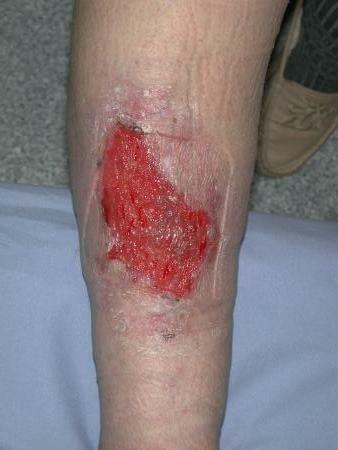 In its simplest form, mechanical debridement involves the use of wet-to-dry dressings which unselectively remove tissue, both healthy and necrotic, at dressing changes . It is known to be painful, can damage healthy tissue and may lead to wound desiccation. Alternative methods include wound irrigation, ranging from cleansing to pressure irrigation , whirlpool therapy , , , ultrasonic therapy and laser therapy . These methods are used infrequently in the UK. Chronic wound fluid differs from that of acute wounds  and excess exudate has an adverse effect on wound healing. Even in the presence of clean healthy-looking granulation tissue, technologically advanced healing enhancements such as growth factors and bioengineered skin will perform badly if exudate is not controlled . Exudate from chronic wounds has been shown to slow down or block the proliferation of key cells in the wound healing process such as keratinocytes, fibroblasts and endothelial cells. This action interferes with growth factor availability and inactivates essential matrix material , . Exudate results in a loss of protein to the host, can damage the surrounding healthy skin, and is also an excellent culture medium for bacterial growth. 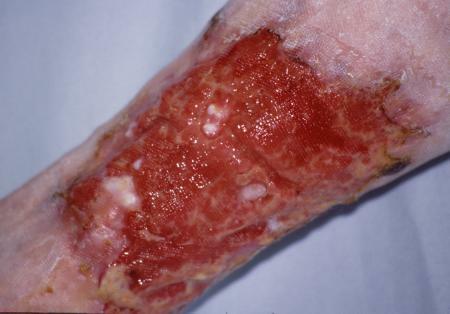 The presence of oedema often increases the volume of exudate produced by chronic wounds. linked to ulcer healing rates. These findings can be extrapolated to include the management of ulceration in the presence of lymphoedema and the healing of traumatic lower limb ulcers such as those associated with pre-tibial lacerations in the oedematous limb. Oedema control in these situations can be obtained with either compression bandaging, hosiery or intermittent pneumatic compression. 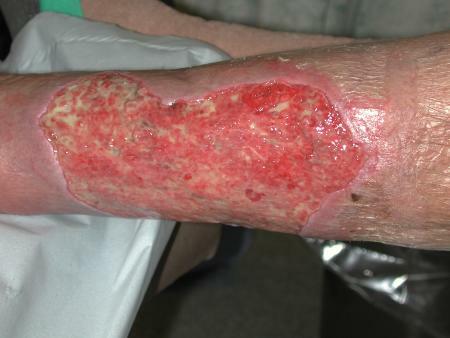 Use of immunosuppression or steroids to control inflammatory exudate from wounds such as pyoderma gangrenousum, vasculitic or rheumatoid ulcers. When choosing dressings for exudate management it is important to protect the surrounding skin and to maintain a moist but not saturated wound environment. Normal wound healing in an acute wound is highly coordinated with rapid choreographed changes in specific cell populations occurring as the wound progresses from injury through repair, and remodelling to healing (Figure 8). This process is impaired in chronic wounds. There is evidence that cells within chronic wounds become senescent (old, unresponsive and unable to divide) ,  and are unresponsive to certain messengers such as cytokines and growth factors , , which causes 'phenotypic dysregulation'. 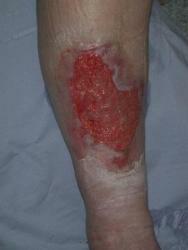 The prolonged inflammatory response seen in a chronic wound delays wound closure. In addition, the extended exposure of the cellular matrix to chronic wound fluid may affect cellular activity in a wound bed and result in cellular senescence . In venous ulcers, for example, there is defective extracellular matrix remodelling, a prolongation of the inflammatory phase, a failure of re-epithelialisation and an increase in senescence that may be related to the duration of the ulcer , . Failure of wound edge migration, which is believed to be linked to an inhibition of normal programmed cellular death (apoptosis) within fibroblasts and keratinocytes , has been suggested by Falanga to be related to healing times . These and other abnormalities in fibroblasts have been demonstrated by others in a variety of chronic wound types , , ,  and have been linked to senescence within the wound fibroblast population , , . This may explain why the use of topical growth factors may not always be effective  and indicates that the use of single topical agents without correction of the underlying cellular dysfunction is unlikely to be the answer to the management of chronic wounds. The superficial appearance of a wound can be misleading. In the same way that all that glitters is not gold, all that is red is not healthy (Figure 9). Biopsy of such wounds frequently shows expression of excessive protein molecules derived from the circulation such as fibrin and fibrinogen. It has been hypothesised by Falanga  that these and other macromolecules may bind growth factors and other wound messengers so freezing the wound in a debrided, but non-healing, red state. 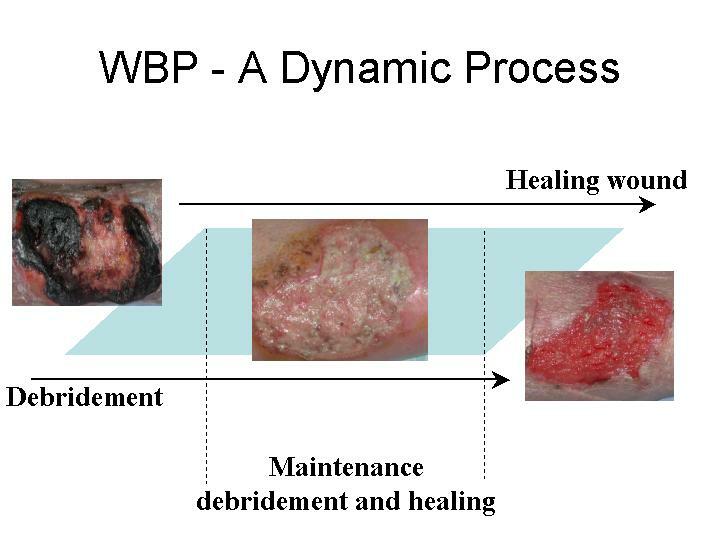 This emphasises the importance of, and distinction between, debridement, which simply refers to the removal of necrotic tissue from the wound bed, and total wound management as envisaged in the concept of WBP, which aims to address the five key areas defined in Figure 1. The elements that make up the concept of WBP should not be seen in isolation. WBP is a continuous process that requires skill and an understanding of the patient, the underlying cause of the wound and the wound environment. The method or methods used for WBP will depend upon the patient, the type of wound and the healthcare setting in which treatment is undertaken. Treatment must allow patients access, either directly or through multidisciplinary working, to the most appropriate therapy for their wound if best use is to be made of technological innovations in wound care. Effective WBP is one element in that care package. The prolonged inflammation and cellular senescence seen in chronic wounds may also adversely affect the efficacy of new, high technology products such as hyaluronic acid, growth factors, protease modulators and bioengineered skin products. It is suggested  that appropriate WBP is necessary to improve the clinical effectiveness of these new, and frequently costly, technologies. This article is supported by an educational grant from Smith & Nephew. 1. Falanga V. Classifications for wound bed preparation and stimulation of chronic wounds. Wound Repair Regen 2000; 8(5): 347-52. 2. Falanga V. Introducing the concept of wound bed preparation. Int Forum Wound Care 2001; 16(1): 1-4. 3. Dow G, Browne A, Sibbald RG. Infection in chronic wounds: controversies in diagnosis and treatment. Ostomy Wound Manage 1999; 45(8): 23-7, 29-40; quiz 41-2. 4. Sibbald RG, Williamson D, Orsted HL, Campbell K, Keast D, Krasner D, Sibbald D. Preparing the wound bed - debridement, bacterial balance, and moisture balance. Ostomy Wound Manage 2000; 46(11): 14-35. 5. Sibbald RG. What is the bacterial burden of the wound bed and does it matter? In: Cherry GW, Harding KG, Ryan TJ, editors. Wound Bed Preparation. London: Royal Society of Medicine Press Ltd, 2001; 41-50. 6. Davey ME, O'Toole GA. Microbial biofilms: from ecology to molecular genetics. Microbiol Mol Biol Rev 2000; 64(4): 847-67. 7. Steed DL, Donohoe D, Webster MW, Lindsley L. Effect of extensive debridement and treatment on the healing of diabetic foot ulcers. Diabetic Ulcer Study Group. J Am Coll Surg 1996; 183(1): 61-4. 8. Baharestani M. The clinical relevance of debridement. In: Baharestani M, et al, editors. The Clinical Relevance of Debridement. Berlin: Springer-Verlag, 1999. 9. Krasner DL. How to prepare the wound bed. Ostomy Wound Manage 2001; 47(4): 59-61. 10. Vowden KR, Vowden P. Wound debridement, Part 2: Sharp techniques. J Wound Care 1999; 8(6): 291-4. 11. Vowden KR, Vowden P. Wound debridement, Part 1: Non-sharp techniques. J Wound Care 1999; 8(5): 237-40. 12. Thomas S, Andrews A, Jones M, Church J. Maggots are useful in treating infected or necrotic wounds. BMJ 1999; 318(7186): 807-8. 13. Thomas S, Andrews AM, Hay NP, Bourgoise S. The anti-microbial activity of maggot secretions: results of a preliminary study. J Tissue Viability 1999; 9(4): 127-32. 14. Bonn D. Maggot therapy: an alternative for wound infection. Lancet 2000; 356(9236): 1174. 15. Ziegler UE. Enzymatic debridement In: Cherry GW, Harding KG, Ryan TJ, editors. Wound Bed Preparation. London: Royal Society of Medicine Press Ltd, 2001; 99-104. 16. Radice L, Cardarekki L, Cortivo R, Abatangelo G. Chemotactic properties of human collagen breakdown products in wound healing In: Abatangelo G, Donati L, Vanscheidt W, editors. Proteoloysis in Wound Repair. Berlin, Heidelberg, New York: Springer, 1996; 51-61. 17. Herman IM, Shujath JM. A role for collagenase and matrix building growth factors. In: Baharestani M, et al, editors. The Clinical Relevance of Debridement. Berlin: Springer-Verlag, 1999; 17-31. 18. Meekes JR. Autolytic debridement. In: Cherry GW, Harding KG, Ryan TJ, editors. Wound Bed Preparation. London: Royal Society of Medicine Press Ltd, 2001; 105-108. 19. Jeffrey J. Metalloproteinases and tissue turnover. Wounds 1995; 7: 13A-22A. 20. Gogia PP, Hurt BS, Zirn TT. Wound management with whirlpool and infrared cold laser treatment. A clinical report. Phys Ther 1988; 68(8): 1239-42. 21. Burke DT, Ho CH, Saucier MA, Stewart G. Effects of hydrotherapy on pressure ulcer healing. Am J Phys Med Rehabil 1998; 77(5): 394-8. 22. Morgan D, Hoelscher J. Pulsed lavage: promoting comfort and healing in home care. 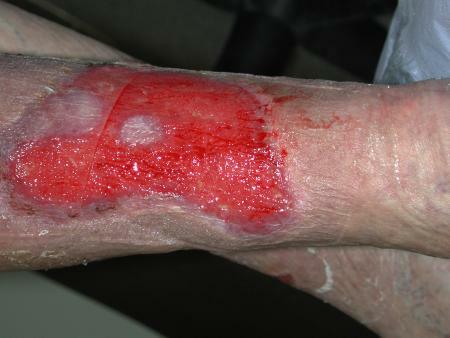 Ostomy Wound Manage 2000; 46(4): 44-9. 23. Nussbaum EL, Biemann I, Mustard B. Comparison of ultrasound/ultraviolet-C and laser for treatment of pressure ulcers in patients with spinal cord injury. Phys Ther 1994; 74(9): 812-23; discussion 824-5. 24. Park HY, Shon K, Phillips T. The effect of heat on the inhibitory effects of chronic wound fluid on fibroblasts in vitro. Wounds 1998; 10: 189-92. 25. 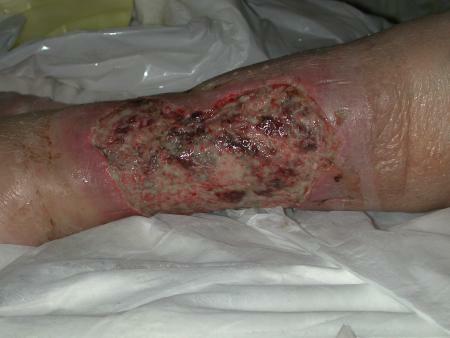 Ennis WJ, Meneses P. Wound healing at the local level: the stunned wound. Ostomy Wound Manage 2000; 46(1A Suppl): 39S-48S; quiz 49S-50S. 26. Duby T, Hofman J, Cameron D, Doblhoff-Brown D, Cherry G, Ryan T. A randomized trial in the treatment of venous leg ulcers comparing short stretch bandages, four layer bandage system, and a long stretch-paste bandage system. Wounds: A Compendium of Clinical Practice and Research 1993; 5(6): 276-79. 27. Deva AK, Siu C, Nettle WJ. Vacuum-assisted closure of a sacral pressure sore. J Wound Care 1997; 6(7): 311-2. 28. Mendez-Eastman S. Negative pressure wound therapy. 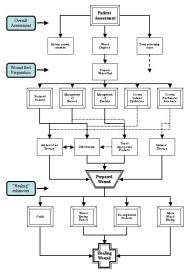 Plast Surg Nurs 1998; 18(1): 27-9, 33-7. 29. M�llner T, Mrkonjic L, Kwasny O, V�csei V. The use of negative pressure to promote the healing of tissue defects: a clinical trial using the vacuum sealing technique. Br J Plast Surg 1997; 50(3): 194-9. 30. Vande Berg JS, Rudolph R, Hollan C, Haywood-Reid PL. Fibroblast senescence in pressure ulcers. Wound Repair Regen 1998; 6(1): 38-49. 31. Stanley A, Osler T. Senescence and the healing rates of venous ulcers. J Vasc Surg 2001; 33(6): 1206-11. 32. Agren MS, Steenfos HH, Dabelsteen S, Hansen JB, Dabelsteen E. Proliferation and mitogenic response to PDGF-BB of fibroblasts isolated from chronic venous leg ulcers is ulcer-age dependent. J Invest Dermatol 1999; 112(4): 463-9. 33. Hasan A, Murata H, Falabella A, Ochoa S, Zhou L, Badiavas E, Falanga V. Dermal fibroblasts from venous ulcers are unresponsive to the action of transforming growth factor-beta 1. J Dermatol Sci 1997; 16(1): 59-66. 34. Mulder GD, Vande Berg JS. Cellular senescence and matrix metalloproteinase activity in chronic wounds. Relevance to debridement and new technologies. J Am Podiatr Med Assoc 2002; 92(1): 34-7. 35. Brown DL, Kao WW, Greenhalgh DG. Apoptosis down-regulates inflammation under the advancing epithelial wound edge: delayed patterns in diabetes and improvement with topical growth factors. Surgery 1997; 121(4): 372-80. 36. Falanga V. Wound bed preparation. 2000 [Video presentation]. 37. Cook H, Davies KJ, Harding KG, Thomas DW. Defective extracellular matrix reorganization by chronic wound fibroblasts is associated with alterations in TIMP-1, TIMP-2, and MMP-2 activity. J Invest Dermatol 2000; 115(2): 225-33. 38. Mendez MV, Stanley A, Park HY, Shon K, Phillips T, Menzoian JO. Fibroblasts cultured from venous ulcers display cellular characteristics of senescence. J Vasc Surg 1998; 28(5): 876-83. 39. Raffetto JD, Mendez MV, Phillips TJ, Park HY, Menzoian JO. The effect of passage number on fibroblast cellular senescence in patients with chronic venous insufficiency with and without ulcer. Am J Surg 1999; 178(2): 107-12. 40. Collier M. Wound bed preparation. Nurs Times 2002; 98(2 (NT Plus Suppl)): 55-57.